A day late, and with heavy emphasis on the first syllable of last night’s 40b40 beer, here at long last are the tasting notes for Grimber-gen. 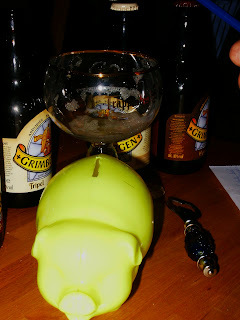 There were four beers on offer: blond, dubbel, tripel and Optimo Bruno. 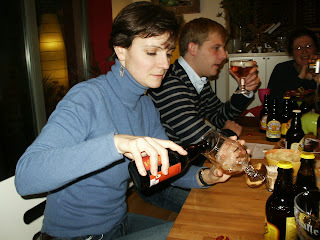 Some tasters then tried other beers, but your humble Competing Athlete stayed true to Grimbergen all evening. Most of us had tried the blond before -- “I had five blondes yesterday”, said Stefan, who probably hopes his girlfriend reads that the right way -- so the first beer most of us went for in this tasting was the dubbel. It had a pleasingly dark red brown colour and 6.5% alcohol. I found the taste thin, sweet and not creamy like others we’ve tried. It has a hint of raisin, too, but the aftertaste is a bit metallic. Others found “toffee” and “orangey flavours”, but everyone agreed that it was a pretty weak offering. “No depth”, said JC, pouring the rest of his into Seb’s glass. We thus turned to the tripel, another one of those hyped-up lightly coloured ales with a strong fizz factor. A “misleading blonde” someone suggested. The initial taste revealed a slight pepper flavour, maybe something of pine. The alcohol level is 9%, but it’s fairly well-balanced with the overall taste. Others noted banana on the nose, but many complained that all the flavours dissipate too quickly. Again, not enough depth. Neil described the aftertaste to be, “like waking up with a hangover”. 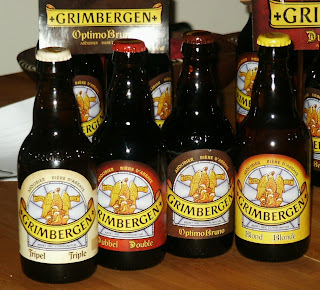 That brought us to the Optimo Bruno, certainly the best of the Grimbergen range, though still not a stellar beer. The primary tastes in this dark beer is yeast: fresh baked bread -- a steaming whole-wheat roll fresh out of the oven. It was sweet with a strong vegetable character, too, like stewed tomato and celery. 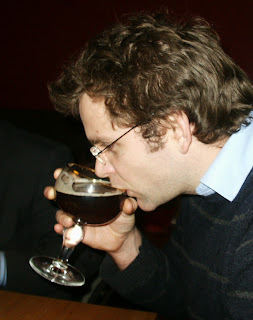 Again, as with the dubbel, this one had a metallic aftertaste. Alcohol is a whopping 10%, though it’s fairly well hidden. Fellow tasters noted honey and burnt caramel smells, and flavours of fruit, particularly grape. Stefan said “marmite”, and that’s exactly the yeasty word I was looking for. This is marmite beer. “The smell is a Hokkaido beer festival on speed”, said Neil suddenly, “but the taste is Edinburgh New Town”. We knew instantly what he meant and all nodded sagely. It was a strongly inspirational moment for us all. Cheers, Neil. That was the pinnacle of the evening, I think. After that, the conversation went downhill in a thousand different directions. My coprolalia started acting up again. Stefan moved on to the blond, reporting, “citrus, light and enjoyable though with a slight metallic aftertaste”. Colombe made yummy sandwiches. 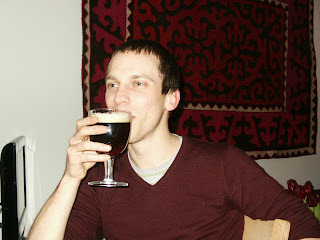 Neil moved over to a Rochefort 10, reporting a taste of, “Drambuie vs beer”. JC and Seb had an Orval and decided to sleep here rather than drive home. Fiona, who was still feeling under the weather, laughed and went to bed. 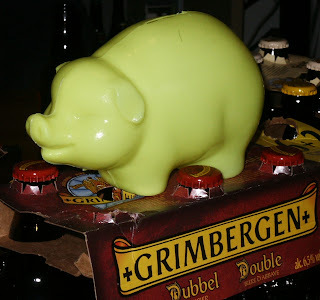 You, dear reader, had better feed the online yellow pig before this plastic one comes after you, too. He's very aggressive and angry. You would be too if you were a yellow pig with a gaping cut on your back. Video: Neil's "chasm of stale beer"
Every time I try a Grimbergan I am dissapointed, so I have stopped trying it. Its Orval for me, it is very hard to beat.